FEMA has continually refused to allow DHAP because officials stated that the Governors of the impacted states/territories had not formally requested it. However, the Governor of Puerto Rico Ricardo Rosselló requested DHAP five months ago in mid-December. Yesterday, FEMA sent a letter rejecting the request. The letter claims that the assistance provided under FEMA’s Individuals and Households Program (IHP)--particularly the Direct Lease program--is a better solution for Puerto Rican survivors. The letter also states that only 181 households have been placed in units with this program but 2,204 households remain in hotel rooms through the TSA program. House Financial Services Committee is holding a hearing on CDBG-DR on May 17 at 10 AM ET. The hearing will be livestreamed on the committee’s website. Witnesses include representatives from the Office of the Mayor in Houston, Harris County, TX, Texas GLO, Urban Institute, and Enterprise Community Partners. The Texas General Land Office has released for public comment an amendment to the $57.8 million state action plan. The amendment reallocates $8 million to the Harris County Residential Buyout Program. HUD has already approved the overall action plan, but public comments on the amendment should be submitted by 5 PM CT on May 24. Florida Department of Economic Opportunity submitted the finalized state action plan to HUD on May 15. The HUD Office of Inspector General (HUD-OIG) released a report on the Texas General Land Office’s capacity to administer CDBG-DR funding. HUD-OIG recommends the agency expand its capacity to ensure it properly spends the more than $5 billion in disaster recovery funds. The report includes specific recommendations, including increasing staffing and updating procurement and expenditure policies and procedures. The Federal Housing Administration (FHA) extended the foreclosure moratorium to borrowers with FHA-insured mortgages affected by Hurricane Maria. Foreclosure actions are to be suspended until August 16, 2018. HUD is holding a webinar for housing counselors about the CDBG-DR program to help them better coordinate with the local CDBG-DR grantee. A group of fair housing organizations – including National Fair Housing Alliance, Texas Housers, and Texas Appleseed – have filed suit against HUD over Secretary Carson’s decision earlier this year to suspend the 2015 affirmatively furthering fair housing (AFFH) rule. The AFFH rule could help ensure that disaster recovery efforts are done equitably by holding jurisdictions more accountable to fair housing laws. Evacuated from PR. A Puerto Rican family that evacuated to Philadelphia after Hurricane Maria share the impact having long term housing has made for them. They were one of seven evacuated families to receive an apartment from the Philadelphia Housing Authority. Other families in New York are struggling to find longer-term housing and get on their feet before the Transitional Shelter Assistance (TSA) program expires on June 30. One family has found work but does not earn enough to move out of the FEMA-funded hotel. Others have found that their uncertain housing situation and lack of reliable transportation makes securing employment difficult. With a new hurricane season approaching and power still not fully restored, many of these families are not planning to return to the island. The largest number of evacuees are in Florida, where an overall shortage in affordable housing make leaving hotels difficult. Affordable Housing in FL Keys. On May 3, Florida Governor Rick Scott granted 1,300 building permits reserved for affordable workforce housing in the Florida Keys. If counties accept the permits, they must ensure that those living in the new homes evacuate within 48 hours of tropical storm winds reaching the Keys’ shore. This provision has caused some controversy, with some groups stating it is “unrealistic and unenforceable.” Some county officials point out that the number of permits is not the problem. Key Largo has 450 permits for affordable housing, but developers are not utilizing them. Community Land Trust in FL Keys. The Florida Keys Community Land Trust is a new initiative to help create more affordable housing in the area. Property damaged by the storm is placed in a public trust, which allows any newly constructed units to remain affordable. Funding for the trust comes from local groups and donations from seasonal residents. PR Fundraiser. Naomi Klein, author of the soon to be released The Battle for Paradise: Puerto Rico Takes on the Disaster Capitalists, is donating 100% of royalties to JunteGente, a local organization in Puerto Rico. More information on the book is here. Recovery in TX. Residents of Port Arthur, TX are frustrated by the lack of assistance for their recovery process. Some have been waiting since Hurricane Rita for funding to repair their homes. Unfortunately, the local government has decided to forego a Home Repair Program in favor of a program for first-time home buyers. Migration to/from PR. New maps and data visualizations show the flow of people to and from Puerto Rico following Hurricane Maria. In coordination with probate estate attorneys in Puerto Rico, the WG has finalized and translated two affidavits establishing occupancy/ownership for FEMA to accept in the absence of legal title documents. WG leaders will present these to FEMA and other related concerns for approval and uniform application across the island. The WG is also preparing a menu of concerns for use by individual organizations preparing to comment on the PR Action Plan for CDBG-DR funds. PR leaders are preparing a collective, sign-on comment document as well. All comments are due on May 25th COB. Members in the WG are beginning to share within their individual and national networks the new promotional tools (flyers in Spanish and English and a graphic to use with social media) the DHRC created to encourage the use of a brief, online form for collecting stories that illustrate the unmet housing challenges low income disaster survivors face. 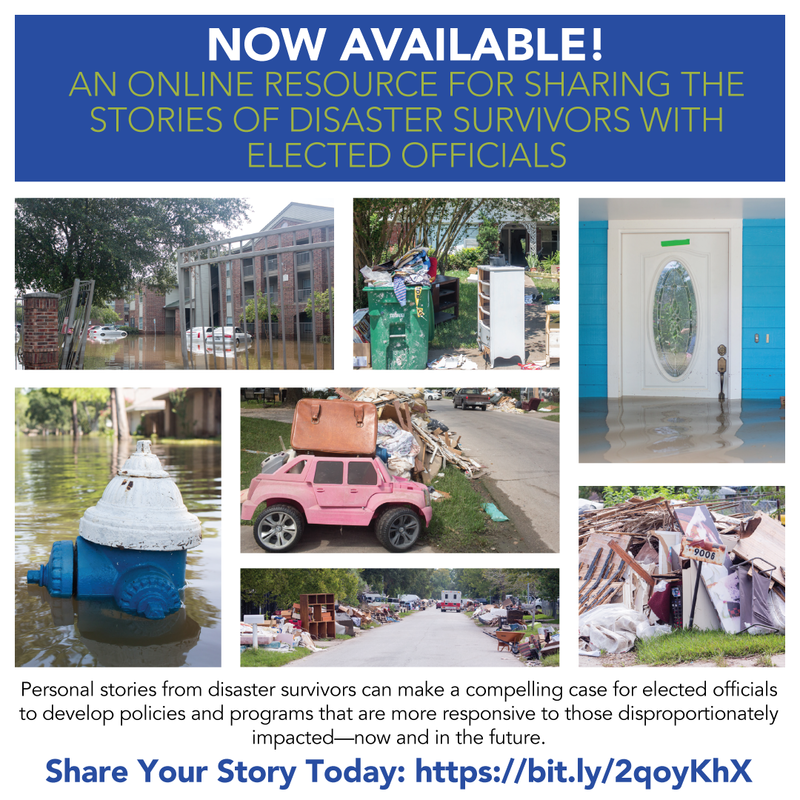 Both National Health Care for the Homeless and National Inclusive Disaster Strategies are promoting these materials at their respective conferences this month. Members of the WG have divvied up sections of FEMA’s IAP draft to prepare a menu of proposed changes responsive to the concerns raised in the recent disaster recoveries. These will be combined and shared for the input of individual comments in the Excel form provided for the 45-day public comment period. NLIHC and 212 organizations from DHRC sent a letter on May 11 to Senate Homeland Security and Governmental Affairs Committee Chair Ron Johnson (R-WI) and Ranking Member Claire McCaskill (D-MO), urging them to include provisions for the Disaster Housing Assistance Program (DHAP) in the Senate version of the Federal Aviation Administration (FAA) Reauthorization Act. The recently passed House version of this bill contained several disaster-related provisions but failed to include DHAP.